One of the questions I get asked fairly regularly is how I collect and curate the articles that I link to in iOS Dev Weekly. I’ve been publishing it for just under four years now and while I’ve talked vaguely about how I go about collecting and curating content for it, I’ve never written it down. So, over the next few weeks, I’m going to be putting together a series of articles with some tips and tricks that I have come up with over the years. This (and the following) articles aren’t specifically about our Curated publishing platform and so should be useful to anyone who’s trying to keep their eye on a community/industry and produce a digest style publication covering it, no matter whether you’re doing it manually or using Curated. So where does the content come from? I have three main sources for the links I include every week. They are Twitter, a good set of RSS feeds and occasional emails from subscribers recommending something. I’m going to concentrate on Twitter and RSS here as receiving recommendations via email is fairly self explanatory! This probably sounds obvious! However, our definitions of everything may differ slightly. Take Twitter for example, I try and read every tweet in my timeline. This is actually harder than it sounds as Twitter isn’t really designed to be used in that way, and most client apps will try and focus your attention on the most recent content published in your timeline. 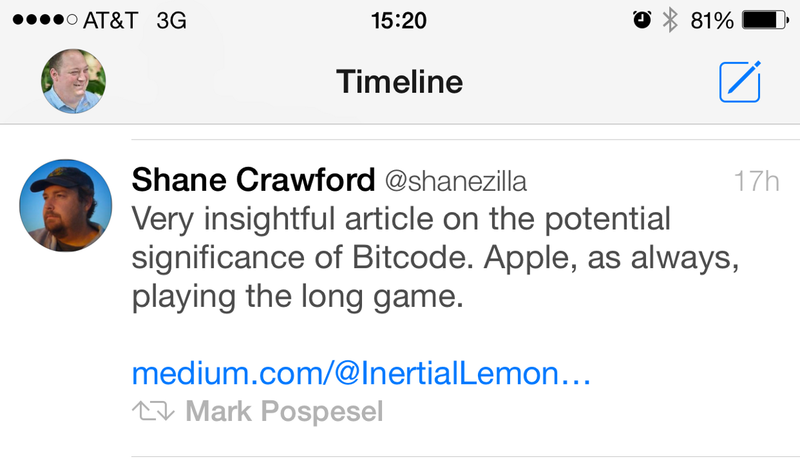 So, having an app which can sync the position you’ve read to and automatically scroll you there is critical. Given the sheer amount of content coming in you certainly don’t want to have to read anything twice. I must have tried every Twitter client there is in pursuit of one which syncs my reading position and there is only one which I have found that can do it reliably. The winner is Tweetbot for iPhone and TweetBot for Mac. Use the iCloud syncing option for read position and you’re all set. The TweetMarker sync option also works, but it’s not as reliable as the iCloud sync in my experience. There’s just one limitation with Tweetbot used in this way, it will only hold 1,000 tweets at a time before they slide off the bottom of the timeline. However, this isn’t a huge disadvantage and it keeps me from leaving it too long between sessions of reading my timeline. Note: If anyone knows a Twitter client for Android/Windows that can also reliably do this, let me know and I’ll update the post. Twitter does sometimes feel a little like a chore when you use it in this way but it remains consistently the best source of links for me. In my industry, this is where the news is shared and it’s worth the extra effort to keep up with it. As for RSS, reading everything is a little easier than it is with Twitter but you’ll still want to use a client which supports syncing of what you’ve already read. My choice for a sync service is Feedbin, it’s reasonably priced and is very reliable. To read the RSS content I use Reeder for iOS and Reeder for Mac. You’ll notice that for both Twitter and RSS, I have client apps on both the desktop and also on my phone/tablet. This is important to me as I really value being able to grab a few minutes here and there to keep on top of content collection on my phone as well as a more comprehensive app for my desktop. When I started curating content for iOS Dev Weekly I already followed a good set of friends and other prominent people in the industry. However, I really try to constantly be aware of new voices who are contributing interesting content by tweaking my Twitter follow list and RSS feed subscriptions as I go. This isn’t really something which comes naturally and it took me a while for it to become a habit. It’s one thing to remember to send interesting articles to Curated after reading them, it’s another step entirely to go back and track down and follow or subscribe to the RSS feed from the author of the article. I usually notice new people via Twitter. Someone I know will retweet someone I’m not currently following and a whole new set of content will magically appear. Also, by following that new person you open yourself up to a whole new set of potential retweets and on the process goes! Finally, in order to keep my Twitter follow list and RSS subscriptions under control, about once a month I go through and unfollow/unsubscribe from some people. I find this keeps the content I’m coming across as fresh as possible without it taking my entire week to read everything. So that’s about it for collection! Hopefully there were a few tips in here which you found useful. In the next article, I’ll talk about content curation and how I decide what makes it into an issue.